You may have heard rumblings about a populist party poised to gain power in Germany’s election on Sept. 24 — or maybe you just heard that there’s an election coming up. To better prepare you for the news coming out of Deutschland over the next few weeks, we’re offering some answers to a few basic questions about the election. What are Germans voting on? To achieve the right proportions, the total number of representatives in the Bundestag can vary with each federal election, but it is always at least 598. Unless a single party wins a simple majority — which is rare — multiple parties will need to join forces to form a governing coalition that, collectively makes up at least 50 percent of the Bundestag. The Bundestag then elects a chancellor, who typically comes from the biggest party in the governing coalition. What are the parties and what do they stand for? The largest parties in the Bundestag at present are the center-right CDU/CSU — two parties that effectively operate as one (and will be referred to as CDU from here on) — and the center-left SPD. 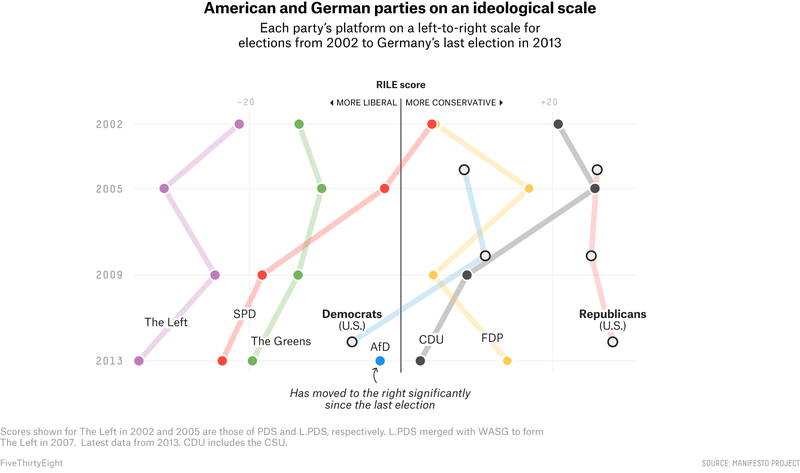 These parties are somewhat analogous to the American Republican and Democratic parties, but both U.S. parties’ platforms are more conservative than that of Germany’s center-left SPD, according to the Manifesto Project. Like the division between the Union and the Confederacy in the United States, historical divisions between the former East and West still play a role in modern German politics. The eastern part of the country is a stronghold of a party called The Left, which grew out of East Germany’s socialist party, according to Andrei Markovits, professor of comparative politics and German studies at the University of Michigan. Other parties tend to fare better in one region or the other because of historic ties to the area or persistent socio-economic differences between the two (in general, the West is wealthier). 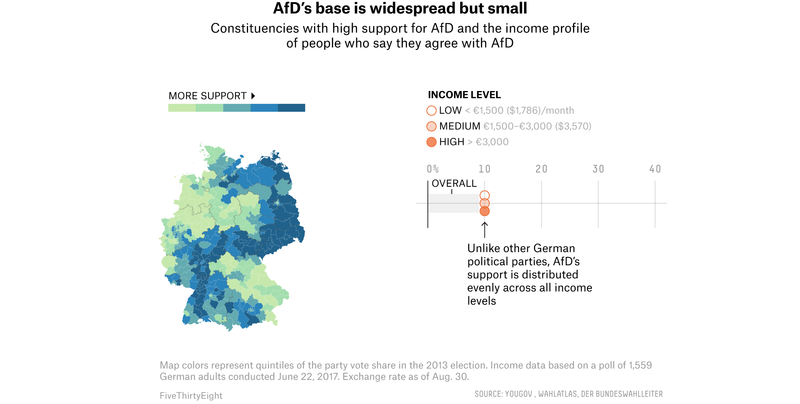 Party associations also reflect economic divides, like they do in the U.S.
What is AfD? Is this Trumpism, German-style? Although it began as an anti-euro party full of academics, AfD became increasingly xenophobic in response to the influx of refugees Germany accepted in 2015, causing its founder, Bernd Lucke, and other original members to leave. Now the party places a strong emphasis on immigration, and is known for making xenophobic statements and being skeptical of climate science, though it retains its stance on returning Germany to its own national currency. The party’s platform does echo President Trump’s brand of nationalism, but AfD is more extreme, according to Christian Breunig, a professor of comparative politics at the University of Konstanz. For example, the party’s official manifesto states that Islam is fundamentally political and is incompatible with the German constitution — a harsher view of the religion than what Trump has publicly expressed. AfD’s base is also similar to Trump’s in that its voters are disproportionately men and most do not have a college degree. While the party has a following in the more economically stagnant former East — as Trump did in the Rust Belt — its support is not easily defined by geography or income. 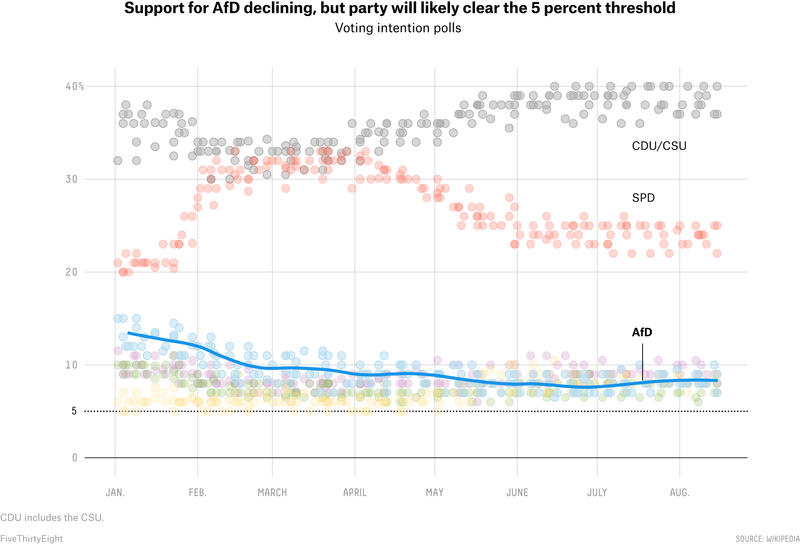 And while AfD has demonstrated, according to Breunig, an ability to bring people who don’t typically vote into the political system, the party is unlikely to gain much power at present; it must compete with several more moderate conservative parties, and its projected vote share remains low. AfD got off to a strong start after it was formed in 2013, and it polled as high as 15 percent this past winter. But its expected vote share has since fallen to 10 percent. While Breunig attributes much of AfD’s decline to a reduction in immigration, Markovits views it as a larger European retreat from right-wing populism in response to Trump’s election (our editor-in-chief has made a similar argument). 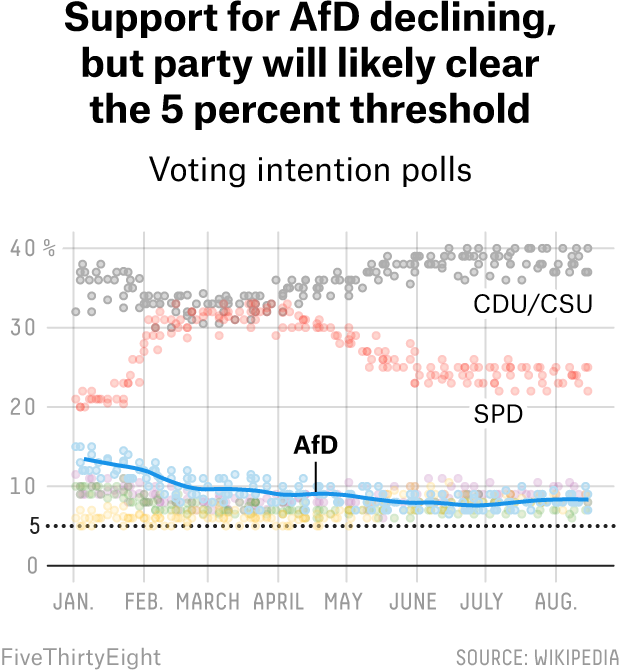 But despite its flagging popularity, AfD is likely to clear the 5 percent threshold for making it into the Bundestag. Then, Breunig said, the question will be how and whether other parties will work with them. What else should I look out for in this election? The center-left’s identity crisis. 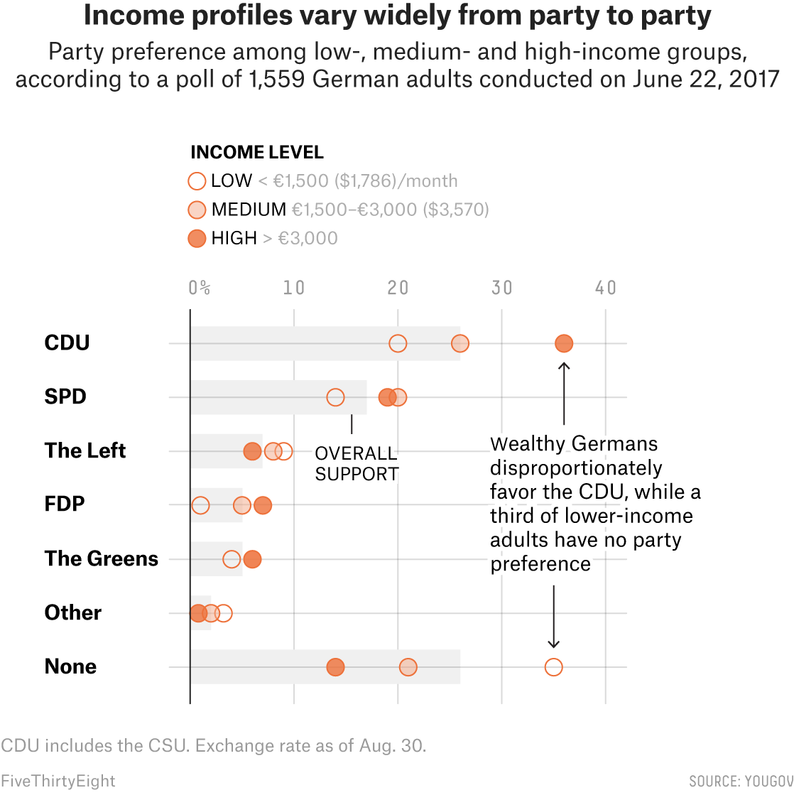 According to Breunig, as the working class that once formed the base of the center-left SPD has declined throughout Germany, those who ascended to the middle class have left the party for more progressive pastures (namely, the Greens), while many of those left behind have been drawn to more conservative parties such as AfD and CDU. Now the party faces roughly the same crisis that the Democratic Party faces in the U.S.: Should it emphasize progressive values to court social liberals and risk alienating what’s left of its base? The return of the FDP? In 2013, the FDP failed to get enough votes to be in the Bundestag for the first time in more than 60 years. But the party has a new leader, and polling suggests it’s on track to get back in. Will Angela Merkel remain chancellor? All signs point to yes. Her party is polling higher than any other by a wide margin, and she remains personally popular. If she were replaced, the new chancellor would most likely be Martin Schulz, head of the SPD party. A different governing coalition? There is a strong possibility that the CDU will form a new government with the FDP, the Greens, or both. It’s also possible, though unlikely, that the SPD could use smaller parties to form a coalition that would oust Merkel, even if her party wins the most votes. CORRECTION (Aug. 31, 10:35 a.m.): An earlier version of a chart in this story did not state that ideological scores attributed to The Left party in 2002 and 2005 were for two of its predecessor parties, L.PDS and PDS. The chart has been updated. The German parliament has two houses, but the other, the Bundesrat, has much less political power and its members are not directly elected. In other words, it’s hard to gerrymander a party into power in Germany. All 299 representatives elected by the districts get a seat regardless of how their party fares in the second vote, so a party that gains less than 5 percent of the vote may still have a representative in the Bundestag.